Virtual Reality (VR) has started to become more popular in today's digital world. Up until now, the technology has been misconceived as being predominantly associated with the gaming industry. However, there has been a huge shift within the companies towards VR, and no, this does not mean that people are playing video games all day. Companies have started to incorporate VR in order to demonstrate real-life training and teambuilding learning situations that can transform the business world and provide results. Learning and development can become extremely costly due to the number of man-hours and resources that are poured into the specified programmes. The need for a tool, that is easily adaptable for different real-life situations, is evident in the business sector and that is where VR has come into play. It has allowed businesses to simulate a reality where the environment is risk-free and cost-effective. For example, Walmart has incorporated VR training for their associates in areas such as; soft skills, customer service and new technology and compliance. They train their employees for events such as Black Friday in order to make sure they were prepared for the risks and how to deal with disgruntled customers. Other companies have also used VR to train their employees in public speaking by combining a simulation that can create distractions and afterwards give immediate feedback to their employees. Virtual Reality demonstrates a fast forward movement in the learning sector as it helps to generate a hands-on experience rather than a lecture style teaching system. This is done by placing your data in a simulated situation in order to make it more understandable, concrete and relatable. VR has changed the game in many areas such as the “try before you buy” concept, introducing established products to potential new customers and forming a new way in creating sales strategies however there is still so much to come in the future. An aspect that is making moves within the VR space is the idea of Extended Reality, which is a combination of virtual and augmented reality. This technology allows a person to feel as though they are in another place entirely. Situations such as meetings over Skype are going to be revolutionized by being able to interact with people all over the world as if you were with them in the room. This will result in furthering business relations by closing the gap between the physical world and the digital realm. Even though the technology for Virtual Reality has been around for many years, the business world is only reaping the benefits of it now. The future for this technology is extremely bright and it is transforming the business world, especially in training and team building, propelling us into the world of digital learning. 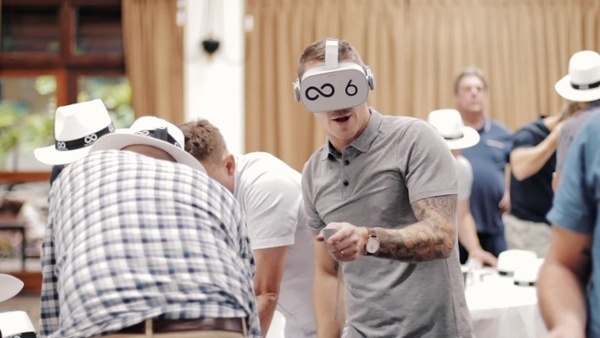 Our new teambuilding event The Infinite Loop has incorporated Virtual Reality in order to put lean management into practice in a fun and exciting way. Check out how it works !